In which I put my wishlist for Star Trek's return to television on display. Star Trek: Discovery, frankly, has it's work cut out for it. The new series from Bryan Fuller, which will see the franchise return to it's native home of television for the first time in over a decade, is more than just an opportunity for Trek to modernize. It is an opportunity for Trek to vindicate it's own existence. Now, I'm going to state outright here, this is my very biased opinion here. There is no consensus, no analysis and no greater truth behind this article. This is me, venting my frustration about Star Trek to the world. See, back in my more youthsome days, when the world was an eternal opal and shows like West Wing hadn't yet skewed my baseline for good writing, I loved Star Trek. It was my obsession. I came to it through the films, which was the best and retroactively worst, means of integration. The trilogy of Wrath of Khan, Search for Spock and Voyage Home imbued these characters and their world to me. The first time I ever heard the words "light-speed", "tachyon" and "anomaly" it was from the mouth of Leonard Nimoy. Thanks to late night cable TV reruns, soon the repeated episodes of the Original Series, and then fresh and current Next Generation brought this lively, detailed, wonderful universe into my life weekly. I had the books, the manuals, posters with cross sections, models, action figures, puzzles and a subscription to Star Trek magazine. I memorized the Encyclopedia from from to back. I could pick Qo'nos out of starchart, and knew the accerlation factors of a warp chart better than I could do my own math homework. I was the type of fan this show seems to breed despite itself. And I hold every one of those memories as cherished, because they came at a fundamental point in my development. It was because of Star Trek that I asked for a telescope for my birthday one year. It was because of Star Trek that I asked to go to the library to research words like "wormhole" and "space-time." It was because of Star Trek that I began to pay attention in science class, and was the only one who knew about orbits and stellar life cycles before the rest of my classmates. Like so many scientists and engineers who have created the technologies that have shaped our world, it was Star Trek that first gave me the glimpse of not just the larger world, but the larger possibilities of our species. As much as I fell in love with the stars and with the intricacies and depths of science, I went another way. Around this same time, a long held desire to one day become a cartoonist was finally quashed with the full realization that I had no artistic ability. From this void of artistic fulfillment, Star Trek rushed in like a wave filling in a hole on the beach, and filled me most unexpectedly with the desire to write. These books I was reading, this show I was watching, these movies I was obsessed over were written by people. I began to notice their names in the credits, the first time I really fully understood that stories were created by people, alone or in rooms with other like-minded maniacs. They were creating worlds, and I wanted in. But as I got older, the shine started to come off the apple. In what is also my earliest encounter with my immunity to nostalgia, as I continued to watch DS9 and Voyager, and as I matured both as a person and as a reader and a watcher, I noticed that more often than not, Star Trek wasn't very good. Voyager was next to unwatchable. Enterprise, by the time it came along, was entirely unwatchable. Surely thinking this was the product of the years beginning to take their toll, I went back and rewatched TOS and TNG and was aghast to discover that they were rarely as good as I remembered. The movies held up, for the most part, the series were far less consistently enjoyable. And so, as I put it away, Star Trek gave me one last first: my first heartbreak. I had loved it, completely, and I no longer did. Life, as they say, is garbage. Coming at Discovery then, I come at it with trepidation, and a long memory of what came before and what this show needs to do in order to be both 1) a show worthy of the modern environment, which has increasingly and accelerantly become one of high quality and b) the Star Trek that the bigger idea of Star Trek deserves. From that perspective then, there are six things this show must do to achieve this lofty and burdensome goal. Here's me being tripe, but yeah, just be better. I watched a documentary on Trek many years ago, so many (and so many documentaries ago) that I can't remember which. The thrust was examining the progressive nature of the original series. All the Big Issues that they tackled in unfriendly waters over three scant years. The first interracial kiss of television, the fact that a Russian was part of the cast during the Cold War, etc. etc. 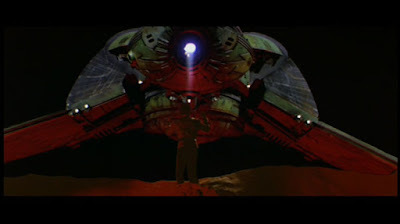 At one point they discussed the famous scene where Kirk governs over a dispute between two members of a race of aliens with black and white skin. "He is black on the right side," the alien declares. "We are white on the right side." In the era of Civil Rights, a poignant if not terribly subtle metaphor for the discussion of racism. Except, the interviewee for the documentary reminds us, the rest of the episode (Let That Be Your Last Battlefield) really isn't anything all that great. It's a fairly bog standard planet-of-hats scenario. Very few of the episodes that are remembered as seminal are actually episodes. There are moments within episodes, which to be fair is the way it should be done as entire Very Special Episodes would get preachy and tiresome. But in order to get to these moments of import and influence, you have to wade through mediocrity. And more than a fair few of them (Spock's Brain, for example) are just terrible, with no moment of revelation. The episodes that are remembered for the whole of themselves (like Trouble with Tribbles, for instance) were ones actually deserving of being recognized because they were, from start to finish, good. The same holds for the rest of the series, though the number of episodes that stand on their own become fewer and fewer. Despite watching all of the series to completion, I could not pick out a single individual episode from either Voyager or Enterprise, could only pick out a scant few from DS9, and a couple handfuls from TNG. TNG's "moments" tend to happen like the old show, existing within the context of lesser episodes ("What [Hamlet] might say with irony I say with conviction, 'what a piece of work is man'" being an excellent example). 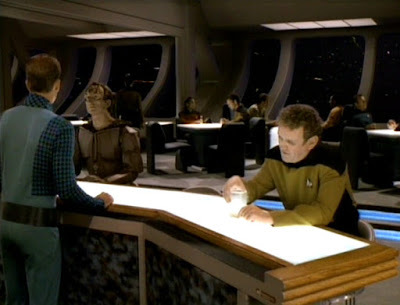 Episodes like The Inner Light or Chain of Command, or DS9's Trials and Tribble-ations or The Visitor surely stand on their own and are awash with great acting and writing, but for the most part it is the impression these series left more than the actual minute-to-minute reality that is remembered. The Dominion War as an ethereal thing. The Temporal Cold War on Enterprise. Seven of Nine on Voyager. I would argue that Patrick Stewart as a mere presence on TNG accounts for more of it's popularity than anything he or any of the other actors ever actually did. Can Discovery just be better? I think so. How TV is made and how it is written has changed a lot since Enterprise left the air waves. Back then, TV was a passive thing. It was the thing that was mocked, the idiot box that families turned on at night so they didn't have to talk to one another. Now, with an overabundance of media, TV shows have to stand out. They have to earn their viewership. The networks can hide and pretend that this is still the era of Cheers and ER and Friends, but the cable channels know the truth. The audience expects more from a show if they are going to make a point to turn in every week (or, more likely, stream the whole thing in one sitting). Bryan Fuller knows this. This is not his first rodeo. He worked in old Trek (on Voyager). He worked on Heroes. And he has refined his method through each of his own series, as the tide of television turned, until he produced his masterpiece in Hannibal. The focus on character to drive plot, the focus on long form storytelling, the integration of visual storytelling. These are where Star Trek has also always been at it's best. And CBS seems to understand this. They are putting it on streaming services. They are doing short runs. They are focusing on long story arcs rather than episodic adventures. These are all the right steps in the right direction, suggesting that this Trek, aside from looking, sounding, acting and feeling entirely different from any of the others, will be better. 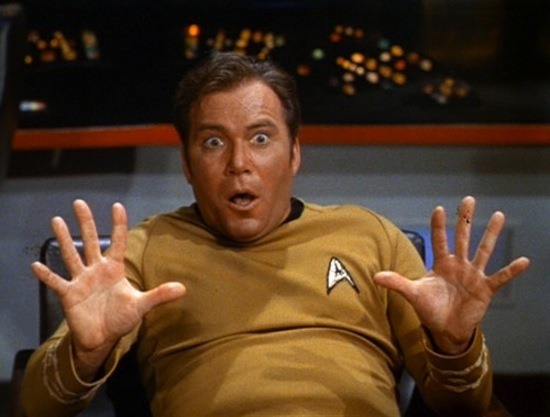 Let's get this out of the way: Star Trek has always had a bit of a Gay problem. They've also had a bit of a Woman problem. Actually, scratch that - what they've had from day one is a Man problem. Because any problems they might have had in addressing any of those other problems comes back to the fact that this franchise has always been told from an American Man's perspective. And I don't mean their Captains, I mean where the story is being told from. 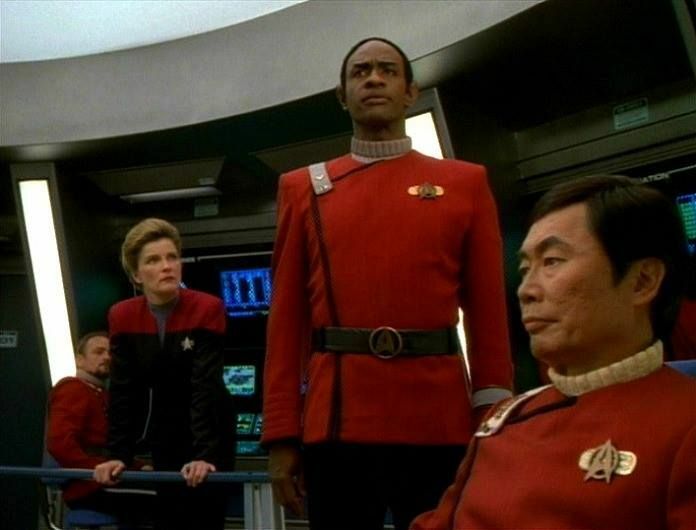 The perspective of Star Trek, as diverse as the audience has always been, has always come from a chiefly American and chiefly male perspective, and as such when it deals with issues, it deals with them from that starting point. And that starting point, during the eras when the various shows were on the air, preferred to do nothing if they could, or do as little while appearing to do a lot if they had to. The result is, by and large, you get series that feature mostly men and mostly white men, and all straight men. The Original Series had six men to one woman. TNG had 5 men and two women as regulars. DS9 had seven men to two woman. Voyager had six men to three women. Enterprise went back to five to two. DS9 and Voyager were the most ethnically diverse of the series, and no I'm not counting British as an ethnic diversity. No one including the British ever have. None of the male characters were gay, or ever hinted at being gay. 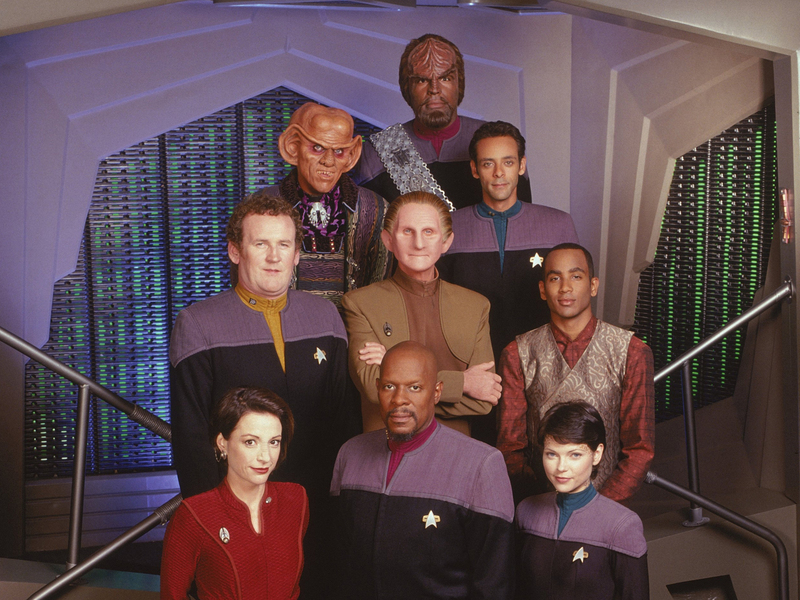 Meanwhile, the shows each had a fanservice character (DS9's were at least recurring characters, though Voyager specifically added theirs half way through their run), had a tendency to objectify female characters as the easiest way to a rating bump, and persisted (in the three later series) in using the trope that female characters have more bisexual tendencies. This is not to say that the female characters were written more poorly than the male characters (though they were sometimes treated more poorly). I'd say on balance, the female characters come out ahead considering how few of them there were, and therefore more of an opportunity to distinguish themselves when focus did come around (Seven of Nine, despite her obvious intent, managed to be one of the more defined characters across any of the series. It helped that Jeri Ryan fell into the Good Actor cohort). It provides the producers an easy out not to deal with racial issues when in Trek's future human race is a non-issue. But the lack of diversity in a future where diversity is absolute is troubling, and shows the prejudice of the modern era shining through. I will concede one point, and that is that in the nineties, when the bulk of Trek was on air, LGBTQ issues were still nothing that the larger culture was willing to broach (go back and bask in the casual homophobia present in Friends episodes). But that makes it all the more obviously absent, as it exactly the sort of subject that Trek should have pounced on and taken a stand. I'm not saying that it would have changed the world, but surely a positive depiction of a gay character on Star Trek twenty years ago, without being reduced to a cliche or a stereotype, might have eased the acceptance of teh LGBTQ community in the larger culture. Bryan Fuller is, of course, all over this. He has stated that Discovery will feature a "progressive and inclusive" cast. But is it too little too late? It is of course wholly necessary and shouldn't be anything that it done specially, to make a point. But from the perspective of affecting social change, would the inclusion of a gay character seem like coming late the party? Before the era of Queer as Folk, Orange is the New Black and The L Word, such an inclusion would have been revolutionary. And in a way it was, except that it was Buffy that did it, and Buffy was not (yet) the cultural milestone that Star Trek was. In 2017 and beyond, I feel a gender fluid character would serve a greater social message than specifically having a gay character. Or more ethnically diverse characters. Or having a differently abled character. Being diverse and inclusive just so you can say you're diverse and inclusive is not an accomplishment, it's a marketing pamphlet from a university. Leading on from the last point, the ratio of human to alien characters in each series - in the lead casts - is about equal to that of men to women. Now obviously the reason for this is that every alien means an actor has to sit in a make up chair for hours while hot, performance-inhibiting, expensive foreheads, ears, eyebrows and paint are piled onto them. It's costly, both in money and time. By the end of Voyager, the result was mostly a succession of aliens with something crinkly going on with their noses. The effect it has is to give credence to the line from The Undiscovered Country, "The Federation is nothing more than a homo sapiens only club." In an era when ethnic acceptance transcends even species, the lack of aliens on starships, or the lack of aliens in prominent senior positions on starships, is troubling. If Discovery really wants to be progressive, the captain of this ship really aught to be from another world. Between 200 and 400 crew served under Kirk during his tenure as captain of the Enterprise. We got to know less than a dozen. With each series, the number of crew that the viewer became familiar with increased, but so did the total number of potential characters. The Enterprise D could carry hundreds more than the original ship, DS9 thousands. DS9 probably did the best job of any of the shows of highlighting the experiences of persons serving under the command of the captain, and better yet, the civilian life of a Federation citizen. For a franchise that is meant to be highlighting the utopia of the future, the various series have given us very little opportunity to actually explore what it means to be a citizen of the 23rd and 24th centuries. About the best chance we got was in following the career of Mile O'Brien, from lowly transport technician to head of Engineering to a space station and war hero. In O'Brien, we actually got to experience the minutia of daily life, the rise in the ranks, the success and failures of a personal life, the anxieties and realities facing someone in this brave new world. As idealistic as Star Trek is, people remain people, and their worries and fears are universal, no matter how "perfect" the age they live in. And I'd like to see more of that. Focusing on the senior staff of a particualr shiop makes sense, in that the big action will happen to them, and the big decisions will rest on the shoulders of the captain. But we miss the experiences of those that serve that captain; a person whom they likely only regard as someone they might overhear on the loud speaker from time to time. Most of the shows had at least one episode focusing on a day in the life of the junior crew, and these windows - especially when compared to the seven seasons of bridge crew-focus - were refreshing. More attention to a starship as an organism and less as a hierarchy would not hurt establishing a truly new and unique identity for Discovery. I don't mean no action. And I certainly don't mean no starship battles. What I mean is, be less exploitative in execution. From the arrival of Seven of Nine on Voyager to the end of Enterprise, you can see the shift in the writer's and producer's thinking. Making things bigger, louder, more sensational in order to attract more viewers. Except that has never been what attracted viewers to Star Trek. Trek viewers, even new ones, respond more to the philosophy and the character than the grandiose and the trivial. Even with the bad writing and the bad acting and the bad special effects and the bad make up and the bad costumes, the strength and depth of character bled through and let most people ignore all the rest. Focus on the issues that deserve discussion, tell the best and fullest story you can with the most engaging characters you can muster, and the audience will follow. Throw explosions and special effects in their face, and they'll turn off. They can get that anywhere, any time. Trek means something more than that. It is still unknown what era of Trek that Discovery takes place in. Is it pre-TOS, during the film era, or after TNG? Whatever the answer, Trek's coverage of the future all but guarantees that wherever Discovery lands, it will overlap with someone we're already familiar with. And while I've never been a fan of gratuitous cameos, when done well, they add substantial depth to the larger fabric of the story. I'm thinking here of Spock on Romulus, Sisko on K-7 Station, Janeway on the Excelsior, or Dr. Singh leading the augments. Perhaps the one think about Nemesis that I didn't hate was Janeway giving Picard his orders. It adds to the notion that these characters continue, that they exist in this world whether we are watching them or not. That these are not just television shows, filling in broadcast hours, but that these are continuing voyages in a final frontier that is ultimately smaller than we care to admit. That, and, a familiar face helps to lend authenticity to strange new worlds; Dr. McCoy and Data wandering the halls of the D, for example. So that's it. Six notions I have for what Discovery needs to do in order to live up to the idea of Star Trek rather than follow in the footsteps of the reality of Star Trek. The idea has allowed it to last fifty years. In order to last fifty more, it's going to need more than that. What do you hope to see from the new series? Leave your ideas, hopes and wishes below. I just want Star Trek: Discovery to not become another Voyager or Enterprise - a flawed show with plenty of squandered potential. Bryan Fuller's involvement raises my hopes, having produced some quality work on television in the past. Agree with a lot of this, but I would add my own personal nitpicking to yours: since finding out Discovery is another prequel I'm really disappointed. Part of what was wrong with Enterprise was trying to make a prequel to a 40 year-old version of the future. It just doesn't work for me without becoming really messy continuity-wise. And it would be so much easier to fix all the diversity problems with another leap into the future. Otherwise you just end up choosing between being faithful to the TOS era (which looks weird and anachronistic), or coming up with laboured narrative reasons for why you've changed everything. ST: Discovery looks like an opportunity missed from my perspective. I just hope the franchise survives it. First and biggest mistake, no matter how good or bad it is, we'll have to pay to watch it. Second mistake is, they are gonna shove Political Correctness right down our throats. I haven't enjoyed anything after TNG. As matter of fact, The whole Star Trek world went straight down hill after Gene Roddenberry in my opinion. The reboot don't even feel like a Star Trek movie. All they do is Blow Crap Up.